Click photo to enlarge. Code no 'Todmorden plan' : Would Todmorden today be a better place in which to live and work if this plan from 1946 had gone ahead? It could all have been so different if radical and highly imaginative plans proposed nearly 60 years ago had gone ahead. Todmorden town centre would now boast wide open spaces allowing unimpeded views of the Town Hall - with arches in the viaduct opened up to divert traffic away from the town centre. 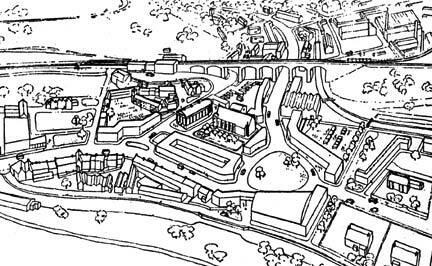 "A Plan for Todmorden" was the brain child of town planning consultant Thomas Sharp, commissioned by the Borough Council and published in 1946 in response to the severe difficulties the town then faced. Warned Thomas Sharp in the 36-page, doom-laden report: "The town finds itself in a difficult, even desperate situation. It is difficult enough to predict with any assurance the possible future of the cotton industry as a whole; it is even more difficult to attempt to estimate the future of cotton in Todmorden." Had the suggested improvements gone ahead the impact would have been tremendous. "These improvements would, I believe, give Todmorden a town centre which would not in the least be pretentious or grand, but which would be orderly, efficient in character with the town, and worthy of it," concluded Thomas Sharp. His words echo down the years. Details of the far-sighted plan are in our Winter 2004-2005 issue: Let us know what you think would have been the benefits - or otherwise - for today's residents: write or e-mail your opinions.